Posted in Blog, Hyper-V, Windows 2008R2 by ronnypot at November 18th, 2010. Thanks for this solution, I have been looking for a couple of day trying to solve this issue on my test Hyper-V server. 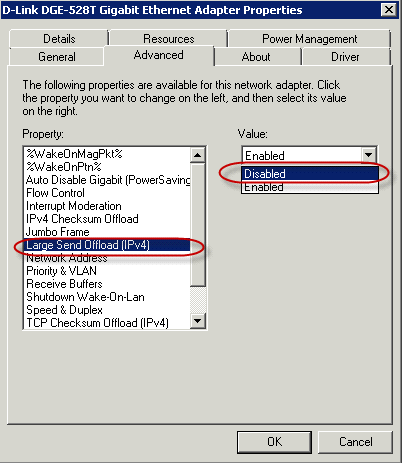 Do you know how to change the NIC settings in this scenario? sorry to say I don’t know how this works within a Server core solution never used that before, but maybe someone else has and can help. Otherwise you might post your question in one of the appropiate Technet Forums, there are a lot of helping people that might have a solution for you. Thank you. That was very useful. I had the same problem. After a week of looking for a solution, this worked for me! Thanks, faced the same problem with my 2008R2 Hyper-V host. Windows Update stopped working after installing Hyper-V role. Thank you for you post. I had the same problem but was unable to find the solution. That is before I found your post. You saved me a lot of time! Thanks! Thanks so much , I have trying fix this issue for days. I spent a few days with this problem. Same network card here. I had exact the same issue with Citrix Xenserver V 6.0.2. Your solution helped me out! 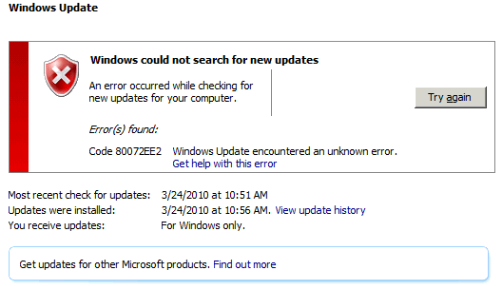 This solved as well my problem with a 80072EFE problem on Windows 7 while doing Windows Updates. Thanks a million! I had this issue as well but the fix didn’t solve it for me. Clicking the “Install updates” button actually had the server looking at an old WSUS server it was still pointed to instead of the internet (though there was no indication of this in the error). Clicking on “Check online for updates from Microsoft Updates” instead of the “Install Updates” button pointed it towards the website which worked. Thanks, same issue in ESXi 5.1 with e1000 and vmxnet3 adapters. After disabling offload, everything OK. Excellent thanks! Same problem with the same NIC!! Awesome! That was a hard catch! You are a Prince among men! Good fix. This is just great, I spent so much time figuring it out … and this solved it!!! Thank you Sir! This valid for all 80* errors with windows update. Thanks a lot.. I had Windows Update error 8024401C on a Windows Server 2012 R2 client running on a 2008 R2 host. All other web traffic worked fine which made it very confusing. Altered this setting on the client and problem solved. The host NIC in this case was a Realtek PCI GBE Family Controller (RTL8167). Superb!! wroking…..any perticulat reason for this settings? Let me note that it may be obvious but this change must be made on the HOST adapter.